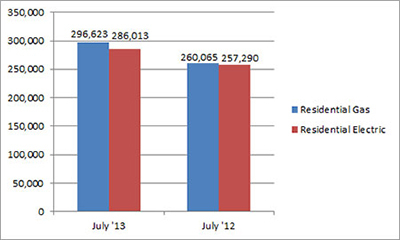 U.S. shipments of residential gas storage water heaters for July 2013 increased 14.1 percent, to 296,623 units, up from 260,065 units shipped in July 2012. 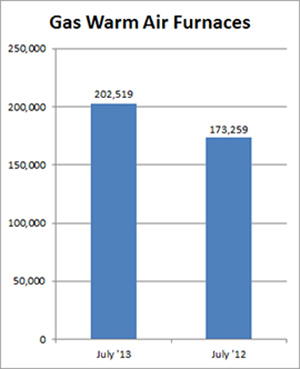 Residential electric storage water heater shipments increased 11.2 percent in July 2013, to 286,013 units, up from 257,290 units shipped in July 2012. For the year-to-date, U.S. shipments of residential gas storage water heaters increased 8.5 percent, to 2,500,077, compared to 2,304,879 units shipped during the same period in 2012. Residential electric storage water heater shipments increased 6.2 percent year-to-date, to 2,338,923 units, compared to 2,203,251 units shipped during the same period in 2012. Commercial gas storage water heater shipments increased 42.8 percent in July 2013, to 7,043 units, up from 4,932 units shipped in July 2012. 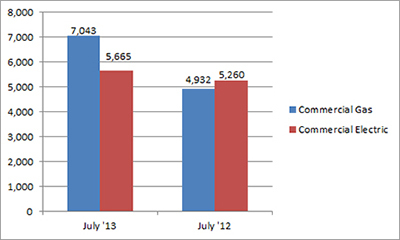 Commercial electric storage water heater shipments increased 7.7 percent in July 2013, to 5,665 units, up from 5,260 units shipped in July 2012. Year-to-date U.S. shipments of commercial gas storage water heaters increased 13.6 percent, to 54,126 units, compared with 47,634 units shipped during the same period in 2012. Year-to-date commercial electric storage water heater shipments increased 3.9 percent to 39,687 units, up from 38,201 units shipped during the same period in 2012. 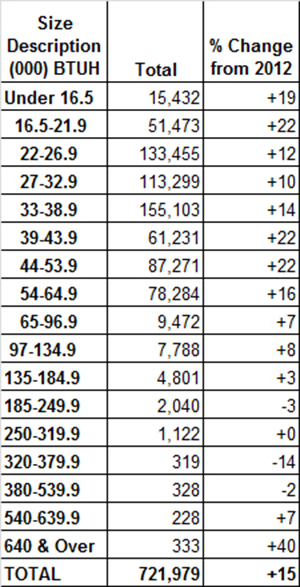 U.S. shipments of gas warm air furnaces for July 2013 increased 16.9 percent, to 202,519 units, up from 173,259 units shipped in July 2012. 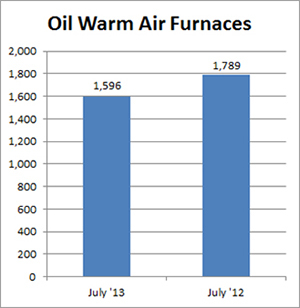 Oil warm air furnace shipments decreased 10.8 percent, to 1,596 units in July 2013, down from 1,789 units shipped in July 2012. Year-to-date U.S. shipments of gas warm air furnaces increased 22.3 percent, to 1,368,297 units, compared with 1,118,872 units shipped during the same period in 2012. Year-to-date U.S. shipments of oil warm air furnaces decreased 6.5 percent to 13,380, compared with 14,304 units shipped during the same period in 2012. U.S. shipments of central air conditioners and air-source heat pumps totaled 721,979 units in July 2013, up 15.2 percent from 626,951 units shipped in July 2012. 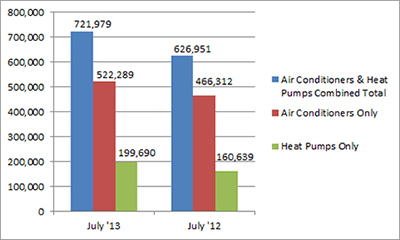 U.S. shipments of air conditioners increased 12.0 percent, to 522,289 units, up from 466,312 units shipped in July 2012. U.S. shipments of air-source heat pumps increased 24.3 percent, to 199,690 units, up from 160,639 units shipped in July 2012. Year-to-date combined shipments of central air conditioners and air-source heat pumps increased 10.6 percent, to 4,259,917 units, up from 3,852,992 units shipped in July 2012. Year-to-date shipments of central air conditioners increased 7.7 percent, to 2,932,810 units, up from 2,723,570 units shipped during the same period in 2012. The year-to-date total for heat pump shipments increased 17.5 percent, to 1,327,107 units, up from 1,129,422 units shipped during the same period in 2012.